The Lauer household has been decked out for Christmas and logs are busy crackling away in the fireplace (or rather, they will be, if the temperature drops to the 40s during the day…not likely). There also happen to be a fair number of drinks being made to stave off the cold weather. While we won’t be mixing any hot drinks for our Cocktail Night / Christmas Party, those mixed will feature some spices that make themselves known around this time of year, and we will be serving a Punch. No, there’s no Kool-Aid, and the only fruit juice present is provided by fresh limes and oranges — just enough to balance out the booze and sugar — and it will be our lead-off hitter for the night. Combine the liquors, juices, allspice liqueur, and syrup in a large punch bowl. Add the ice block to the mixture approximately 15 minutes before serving. Float the orange and lime slices on top of the punch. Dust each serving of punch with freshly ground nutmeg. Serves 12-18. Share and enjoy! From Chantal Tseng, The Tabard Inn, Washington, D.C. Steep tea for 3-5 minutes in water at 203° F. Stir in the maple syrup and make sure it dissolves, and you’re good to go. The Zoar Valley Punch, named for the park in upstate New York, is perfect for Autumn or Winter, featuring the lovely aged flavors of dark Jamaican rum and apple brandy (two of my favorites). There’s also some pimento dram / allspice liqueur tossed in the mix (our excuse to file the punch under “holiday spices”) along with the unique black tea-infused maple syrup. The result? 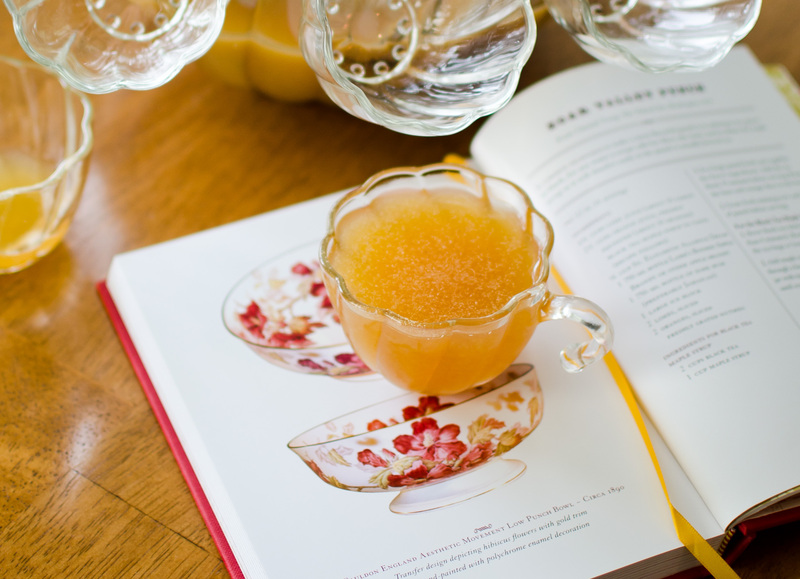 The Punch turns out with a flavor that is remarkably similar to an apple cider-based drink, but with a light, refreshing tang of lime against a background of winter spices. I originally figured that the Appleton Extra rum might be a bit to strong for the mix, but nope, it plays well with others. I used Grade B maple syrup (which is darker, with a richer flavor) and a light Lapsang souchong tea (which is smoked), and the syrup is almost good enough to drink on its own…just drizzle a little maple syrup into your Lapsang next time you make some. I’m always amazed at how certain ingredients can emphasize the taste of cider in apple brandy…citrus and spice always seem to do the trick. Here, the 100-proof from Laird’s is robust enough to hold its own in the punch and is accented by the other ingredients. 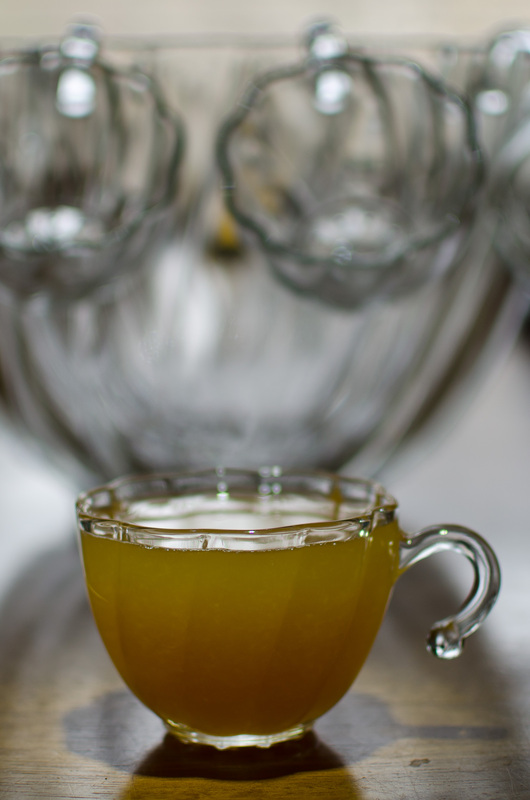 While a bit removed from the traditional, basic punch, the Zoar Valley Punch can be broken down into the same basic components: sugar, citrus, water, and booze. Of course, there’s more to it than that — the preparation method used is extremely important. While I had considered making a hot Punch for our wintry evening get-together, the prep time was not encouraging (boiling water, and then keeping the punch warm? Meh, and I refuse to serve it in a crockpot). I should note that hot punches are much easier to make, however, because of dilution: in a cold punch, you have to calculate (roughly) how much water your ice will contribute to the Punch, but with a hot one, the water is added all at once, and is measured. The benefit of a cold Punch, however, is that it dilutes as the night wears on, so your guests won’t be sipping the same strength of booze all night long (as much as they might enjoy that). With the Zoar, we also skip the trouble of making oleo-saccharum — sugar infused with citrus oil — that makes up the sweet portion of traditional punches. The recipe itself comes from Chantal Tseng of the Tabard Inn via The Punch Bowl by Dan Searing; Searing is an evident disciple of David Wondrich’s Punch-making techniques (documented in Punch! The Delights & Dangers of the Flowing Bowl) and provides a wonderful array of punches, seperated by base spirit, as well as techniques and fairly specific brand recommendations, not to mention a brief history. Highly recommended reading. Stir with plenty of ice and either 1) strain into a double rocks glass, or 2) pour unstrained into a large tumbler or highball glass. Dust with ground nutmeg. You could also split this into two smaller drinks. Since the punch will greet the guests and provide them something to sip, I’ll be mixing two other cocktails side-by-side for everyone’s second round. One is a holiday classic, if not a year-round classic, from Barbados: the Corn n’ Oil. 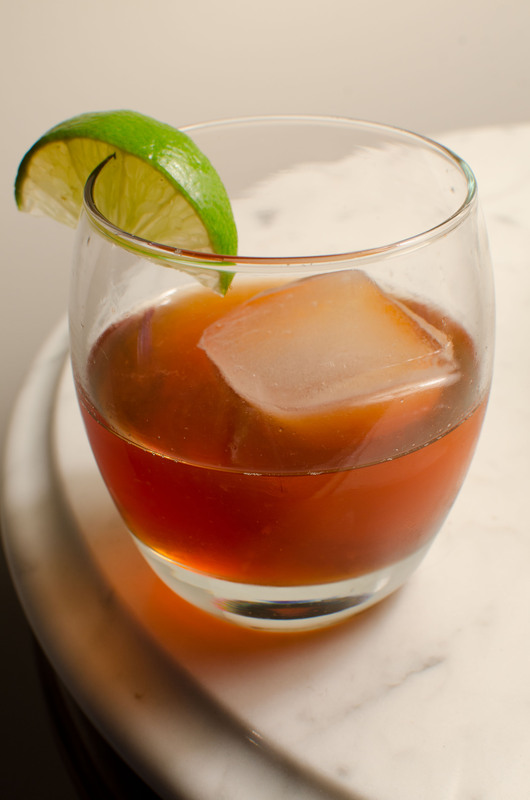 Featuring, once again, a dark rum (in this case Mount Gay Extra-Old), the odd liqueur known as Falernum (redolent of cloves and lime) and a heady dose of Angostura bitters, the Corn n’ Oil is a wonderful, spicy rum drink. Combine all ingredients in a double-rocks glass, add ice and stir. Garnish with the squeezed lime wedge. Alternatively, combine all ingredients in a mixing glass and stir with ice, then strain over a large ice cube in a double-rocks glass. I should note that the Corn n’ Oil will morph and change its nature considerably depending on the rum that you use and the proportion of that rum to the falernum (hey, it’s a mixed drink, that always happens). Trusty Paul Clarke has found that Cruzan Blackstrap, best described as the über-molasses rum, makes a heavy-hitting version of the drink (being mixed by Murray Stenson, it was bound to be good). I find that Mount Gay, from Barbados, works very well, as do dark Jamaican rums like Appleton or Meyers’s. There is a large amount of Angostura bitters in the Corn n’ Oil, nothing on par with some of Jamie Boudreau’s drinks, mind you, but in this case the rum and falernum eliminate most of the bitterness and amp up the spice to ridiculous levels. My own experiments with Cruzan Blackstrap have led to a drink that tastes remarkably like Coke, which isn’t a bad thing, but I prefer something a little lighter on the molasses. A note on falernum: I like the heavy-hitting clove of John D. Taylor’s Velvet and the fact that I can buy it without resorting to making the stuff at home (though I’m planning on creating an experimental batch). Fee Brothers’ Falernum has too much of a citric acid taste for me, and has fallen by the wayside in my booze supply. If you’re truly ambitious, you can make your own with Paul Clarke’s much-talked-about recipe from 2006, all the rage at the time…be sure to take a glance at his comparison between an early versions of his and the Velvet. The Chanticleer Society also had a bit of a discussion, which features an additional recipe for homemade falernum. One more tip: when looking for the Velvet, be sure to check the bottle before you buy — if it’s pale in color and it has cloudy crud (a technical term) floating in it or settled at the bottom (give it a shake), don’t buy it. Chances are, the bottle was stored in the sun, or is ancient, and the lime juice in it has started to grow. Velvet falernum should be clear and light gold in color, with no sediment. I found this out the hard way after buying a bottle at Toco Hills Giant Package Store — all of their falernum was growing and gaining sentience (a side note: their selection is among the best in Atlanta, so one mark against them isn’t so bad). While the name “Corn n’ Oil” remains shrouded in mystery — strange, for such a Caribbean classic — our third drink of the night makes a bit more sense, as far as nomenclature goes. We’ll be serving the stark-white Frostbite. Shake with ice and strain into a chilled cocktail glass. Garnish with freshly grated nutmeg or cocoa powder. Essentially a Tequila Alexander, the Frostbite is a wonderfully surprising dessert drink. Who knew tequila and cacao could be best friends? The wild taste of 100% agave tequila is tamed here by the liqueur and the cream, meshing perfectly with the more vegetal notes of the cacao…it is a bean, after all, so maybe the pairing isn’t so mysterious; it’s presence in Mexican cuisine — think mole sauce — certainly isn’t unknown. 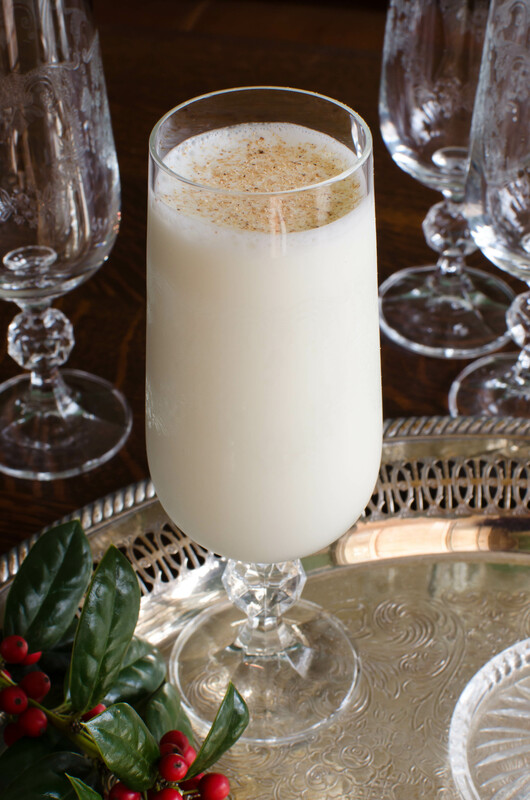 The Frostbite is quite simple, but as good as, if not better than, the famed Brandy Alexander. Use a nice cacao and tequila — not Hiram Walker and Cuervo, please — and a true heavy cream (half-and-half, maybe, but milk is way too thin). As Robert Hess mentions, with a dash of grenadine, the drink becomes a Silk Stocking (funny, but what comes to mind is, “What a great lamp! You should see it from out here!”). Be warned: you’ll occasionally run into rogue versions of this drink involving blue curaçao. While not especially terrible — the blue stuff does have its place in the drink world — using too much will over-sweeten the drink, as will the aforementioned grenadine. If you’d like an “ice-blue” Frostbite, however, a small dash of blue curaçao is OK in my book. At a cocktail party, the drinks are the stars of the show, but let’s not forget the supporting cast. Also featured will be bacon-wrapped dates (you have to try them) and what I’ll call Grown-up Pigs-in-Blankets, among other things. We’re also making this cocktail night a bit of an hors-d’oeuvre-and-dessert potluck, so we’ll get some tasty dishes representative of the neighborhood. Everything goes well with Punch, right? 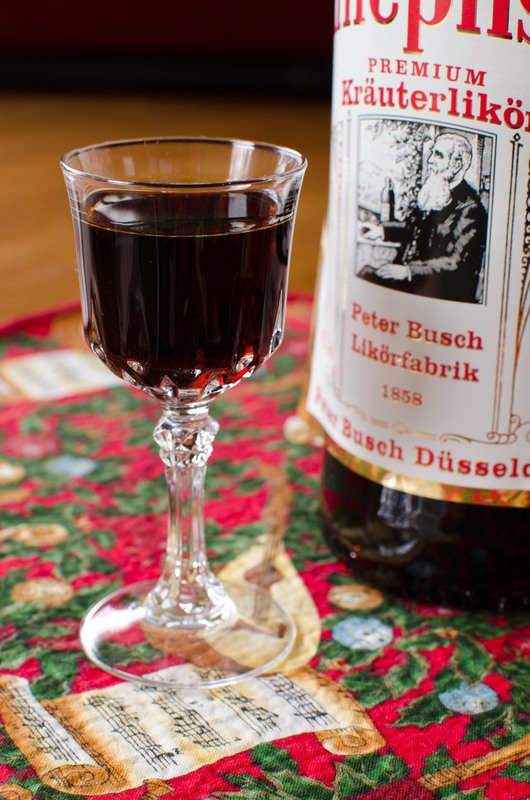 The finale will be a cordial glass of Killepitsch Kräuterlikör, which I think is a great, intense, herbal digestif. I suppose it’s similar to Jägermeister, though I’ve yet to compare the two side-by-side. I’ll spare our guests from tasting the Fernet-Branca, Cynar, or Campari…this time. A nice alternative might be some of that homemade spiced rum I have sitting around. Cheers, Merry Christmas, and Happy Holidays! I am looking forward to next week’s gathering. The drinks sound great! I will be bring my peach bread pudding with bourbon sauce. This entry was posted on December 9, 2011 by IJ Lauer in Angostura, Apple Brandy, Creme de Cacao, Drink Recipe, Falernum, Heron Social Club, Lime Juice, Orange Juice, Pimento/Allspice Dram, Rum, Tequila and tagged allspice liqueur, apple brandy, black tea, cocktail, corn n' oil, cream, creme de cacao, falernum, frostbite, holiday drinks, lime juice, maple syrup, nutmeg, orange juice, recipe, rum, Tequila, velvet falernum cloudy, zoar valley punch.